“I woke up in an ambulance covered in blood”…..
That’s how this story goes… but we can’t start or finish there. That moment was simply the cumulative effect of my desire to be a STAR, and the Catalyst that caused me to be the telescope from that point on. So let’s back up about 15-20 years and figure out how I got to that moment, and how I was changed by that moment. I was a basketball player at one time, and a pretty darn good one to boot. Back in the day my entire identity was consumed with the thought of basketball. I lived it, breathed it, slept it, and I never allowed my identity to be anything other than the sport that I loved. Now looking back I know why I played basketball. Yes, I loved the feeling of the perfect shot, the feeling of the DUNK….. yeah I loved the pace and the strategy…. But much more than any of those things I loved that people respected me because what I could do on the court. I loved that I was introduced as the STARTING GUARD, AT 6’ 1” JASON ROY. At the time I lived at NC State and I was struggling with purpose in life. School was just a way for me to keep my parents believing that I was going to turn out ok, but if I’m honest I knew that God had something else for me…. I just couldn’t figure out what. Aimless, would be the perfect word to describe who I was while I was in college. The one bright light in my life was my beautiful and Godly girlfriend Cortni who lived 4 hours away at Mars Hill College. The night that changed my life started with a brief call to her. I remember the conversation ended with me saying …. “I’m gonna go play some ball at the student center now….. Hey, if I break my leg would you come see me?” Cortni laughingly and replied, “Oh shut up, just go have some fun and I’ll talk to you tomorrow!” With that I hung up the phone never knowing how much foreshadowing was in that phone call. So I went to the student center and immediately walked into the biggest game on the court. Within seconds I figured out who the “big dog” was on the court and began analyzing his game. As soon as I could I switched up on defense so I could guard him and in turn he did the same on his end. That’s when I went to work. He was talking trash, I was talking trash and the game got serious. After a big play on the defensive end I stole the ball and ran up the court on the right sideline, I had a man open on the baseline and I passed the ball and then took a hard cut across the top of the key and then……… BLACK. I woke up in a ambulance covered in blood. I couldn’t remember my name, who I was, where I was or why I was in an ambulance. When I got to the hospital they put me in a wheel chair and rolled me down to hall to sit in the darkness by myself. I remember sitting there for hours trying to figure out my name and my phone number. No matter how hard I tried I just couldn’t figure it out, and minute-by-minute the pain was getting worse as the shock wore off. I had no idea that I had a broken nose, or that I had lacerations from the inside of my eye to the front of my nose…. And a huge gash under my eye as well. I was just lost… with no way out. It was literally the darkest few hours of my life. I felt completely trapped inside my own body for what seemed like an eternity. Suddenly the door flew open in slow motion and I saw someone I thought I knew running to me… and when I looked up and saw his face I finally remembered who I was. That’s when the lights came back on. My roommate Josh had come to the rescue. To make a long story short, I had to live with a disfigured face for 6 weeks until the swelling went down and then they took me back in to re-break everything and put it all back together. and in my case it ended up being both. For 6 weeks I had time to think about my life, who I was and where I was going, and I’ve got to be honest I didn’t like what I saw in the mirror. You see up until that point I had lived for my fame, my glory and God, while a part of my life, was not the center of it. The unfortunate by-product of seeking Glory is the danger inherent to the famous. There are so many other people seeking it too. You want all the riches and all the fame?? Well so do other people who are more vicious and less concerned about consequences than you. What kinds of things come from seeking Glory? Wickedness like: Murder, corruption, contempt, false gods, false doctrine…. Etc. Have you ever read anything out of the book of KINGS? GLORY was all those guys wanted and it led to HORRIBLE THINGS. I figured it out the hardest way possible, but in reality that’s the way this world works. If you want to chase the Glory, be aware that there will be other people who will do ANYTHING to achieve what you want. The greater issue is that you will find yourself willing to do uncharacteristic and ungodly things in your pursuits as well. So what then was the lesson? For me it became simple. POINT TO JESUS. I had lived 19 years for me and I realized that I couldn’t handle the pursuit of Glory and Fame, but I knew the one who could. In fact I could be a part of a GLORIOUS STORY about a FAMOUS ONE who can handle all challengers. When I realized that I just needed to point to HIM, I finally figured out what my life was about. Just like my friend who walked into the hospital and jarred the memory of who I was, Jesus looks into our eyes and reminded us who we are. Jesus looked into my eyes and said, you could make so much more of ME if you’d play the music that I’ve gifted you with. When I felt that calling on my life I took a crazy chance, I started a band called Building429 and decided that it was time that I did something that mattered…. Like Magnify my God who is worthy of Glory, AND can handle all challengers. I found peace and hope in the midst of the darkness, because for the first time in my life, I realized that I am meant to be the telescope, not the star. Maybe that’s what you need to remember too…. 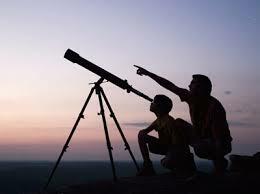 We are all telescopes, not stars… the Glory is in the star, not the one that magnifies the star. As long as we point to the Star, the one worthy of Glory, people always end up amazed. Its really been on my heart lately to work unto the Lord. In doing so i can magnify Him to my coworkers and ultimately just everyone in my life. Really need to learn how. I notice i fog the telescope by complaining too much to myself, getting stressed and angry; and not putting in my best. Thats what i really need to work on. You have any advice? Thanks for another blog Jroy! Are. Excellent back ground JRoy. Awesome blog,Jason!I was just thinking the other day,I haven’t seen one from you in awhile.They always hit the nail on the head! Bless you,brother!! I think this is just absolutely profound and really a great way to measure the whys in my life. Why am I doing what I am doing. I know that I am in a ministry to serve the Lord, but it is also a competitive role that I have. This can cause a lot more looking over the shoulder rather than not only being that telescope but looking through it too. I’m going to give your question some serious thought. I really needed to read this today. I want to thank you for writing this blog. I want to be a shining light wherever I go. It is great that you wrote another blog because it has been quite some time since we have seen a blog from you. Your blogs are always very encouraging, I also needed to read this today. God bless you for all that you do. Your songs are amazing and very encouraging. You guys live up to your name, You definitely have encouraged me and many other through your music. God bless you guys. A couple of weeks ago I was asked to share part of my story having to do with my gifting… I really struggled with it. It felt arrogant to share about me. But, what I realized was that I was being deceived and it was a false humility to not share the gifts my God has given me. A couple of years ago a friend of mine invited me over for coffee on my birthday. I got the kids up that morning and we headed over to her house… and she had a breakfast feast set up. I was completely blown away. The table was set beautifully with candles… and she had made all sorts of pastries… It blessed me so much. Later that day when my husband got home and I shared what my friend did… SHE was the one honored. So is it with our God, don’t you think? When we share the gifts He has given us… HE is honored as the gift giver and others are encouraged. We can be seeking glory for ourselves… or we can also be seeking a false ‘humility’… both rob us of the opportunity to honor our God. On one hand we are seeking glory for ourselves by looking to be the ‘star’ and on the other hand I wonder if we are like a telescope that won’t remove the lens cap.